15 Luglio 2018 | in English. A Public Prosecutor overwhelmed by scandals supports a political operation against those who in these years represented the only dissenting voice in the city of Turin, the Police Department whines after it looks for a fight on every Mayday with loathed demonstrators and Salvini settles a score against those which, in the latest years, protested every public appearence of his, while the Turinese left asked to stay at home in order to not give visibility to him. A massive repressive operation took place on Friday 13 in Turin. 15 precautionary measures were notified at dawn, against university students, antieviction and notav struggles' militants: 9 of them were put under house arrests. The social centre Askatasuna and the people's space Neruda were raided, too. 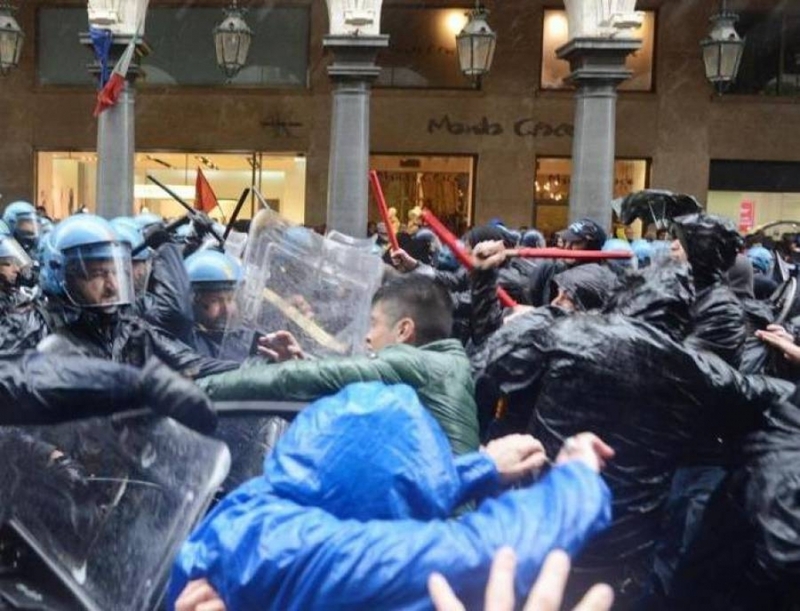 The operation is linked to Mayday 2017, when amongst the general bewilderment the police charged in order to prevent the social bloc from entering the demonstration's conclusive square, out of fear of protests against confederal trade unions and the Democratic Party. We have been through a lot, but what it is written in the decree is beyond belief for the explicitly political character used in order to justify the arrests. We read in the documents of the public prosecutor Rinaudo that as evidence against our comrades there was to "remark their extraneousness to the demonstration and the values expressed therein" by forming a bloc separated from the one of the unions. We strongly claim that the unions' bureaucracies and the Democratic Party are those extraneous to the workers' holiday and to its values. We wonder how is it possible in our country for a bloc made of precarious workers, students and families under eviction to be charged in cold blood, in order to prevent them to express their dissent. Against those who, in these years, sold the youth and the workers' rights with the Fornero social security law, Jobs Act law and school-to-work transition? In which State who has the arrogance of calling itself a democratic one is the Police Department to decide who can enter a square and who can't? We also smile as we see the prosecutor Spataro and the chief prosecutor Saluzzo - that on last thursday were daydreaming about boats of refugees at the Murazzi riverside and steadfastness against xenophobic hate crimes - to endorse a repressive operation against the only bloc in which immigrant workers and families who chose to participate to the cortege could be found. If these are the accusations, we claim them with pride. On that day our only goal was to enter the square in order to make heard a dissenting voice and avoid the Mayday demonstration to be the monopoly of organizations which have nothing more to do with the safeguard of workers' rights. If the alleged crime is to not bow down in front of the bullying and arrogance of the institutions we are guilty. It seems to us that many are realizing it in these years of crisis. The criminals are those who sat in the halls of power, dismantling workers' rights and stealing everybody's money, certainly not those who were in the front line in the strikes, in the antieviction pickets and fighting a state which is weak with the strong and strong with the weak. We are asking to the rank-and-file militants of the unions to make a desperate bid for dignity in front of the umpteenth operation which wants to destroy even the mere possibility of expressing a dissenting voice against the anti-people politics of the latest years. We are asking to everybody concerned by the evident authoritarian drift this country is taking to stand against this umpteenth operation against militants that generously gave their best in these years on the side of students, workers and victims of the crisis.